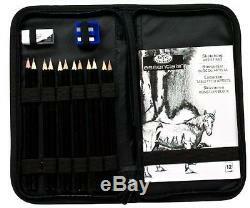 Drawing & Sketching Pencil Set Kit Artist Art Graphite W/ Zippered Case. The customized zippered carrying case allows ease of travel while storing and protecting your art tools. The Keep N' Carry features elastic bands to hold all your tools in place for easy traveling and storage. Includes 12 graphite pencils, 1 white eraser, 1 sharpener, 1 drawing pad and 1 zippered carrying case. Keep N' Carry measures 6-inch by 10-3/4-inch. Everyone will love the Keep N' Carry Artist Sets from Royal & Langnickel. This customized zippered carrying case features 12 graphite pencils, an eraser, a sharpener, and a drawing pad. Perfect for class, travel, or keeping your studio organized. 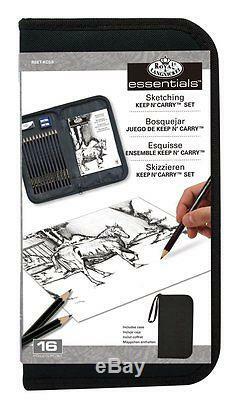 The item "Drawing & Sketching Pencil Set Kit Artist Art Graphite With Zippered Case" is in sale since Monday, December 22, 2014. This item is in the category "Crafts\Art Supplies\Drawing\Other Drawing Supplies". The seller is "kcl1335" and is located in Ohio. This item can be shipped to United States.